The Vehicle Theft Alarm (VTA) Module is a logic controlled device that monitors vehicle doors, hood, liftgate and ignition tampering. Alarm activates by sounding horn, flashing all external lights and preventing vehicle engine from running. VTA system arms during normal vehicle lock-up procedure (ignition off, all doors locked with power locks). Security light flashes for 15 seconds during arming process. Security light remains lit during arming process if no signal is received from hood switch. When the VTA is triggered, horn sounds for 3 minutes while flashing all external lights. Headlights, park and taillights continue to flash for an additional 15 minutes after horn stops. VTA system features a tamper alert function that notifies if vehicle has been tampered with by sounding horn 3 times once a front door is unlocked. The VTA will not arm if door is locked using key or manual lock control. NOTE: If vehicle battery is disconnected and reconnected, the VTA system enters a power up alarm mode. The headlights, park and taillights will flash. The engine will not run. To exit this mode, the VTA system must be disarmed using key or keyless entry transmitter. NOTE: VTA system or VTA system self-test will be inoperative if Powertrain Control Module (PCM), has been replaced within last 20 ignition cycles. sound twice, verifying their operation. illuminated entry. Unless illuminated entry system is disabled, it is necessary to wait 30 seconds after each door opening or closure before testing can occur. following tests, indicating proper operation. Operate power door locks in both directions. Rotate key in both door lock cylinders to unlock position. Horn will sound as switch closes, and again when it opens. Allow at least one second between close and open position. also take VTA out of self-test mode. in the WIRING DIAGRAMS article in the ENGINE PERFORMANCE section. Front Door Key Cylinder Switch See Fig. 1. Liftgate Key Cylinder Switch See Fig. 2. Mechanical Instrument Cluster See Fig. 3. 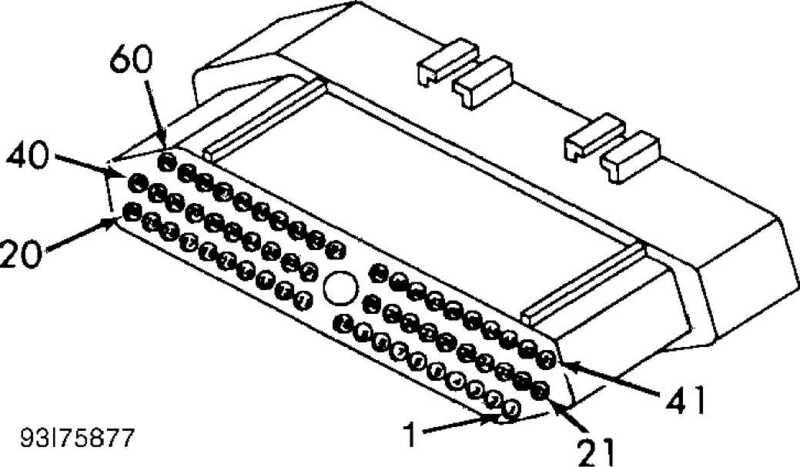 Powertrain Control Module See Fig. 4. Remote Keyless Entry Module See Fig. 5. Vehicle Fuse Block See Fig. 6. Vehicle Relay Center See Fig. 7. Vehicle Theft Alarm Module See Fig. 8. Fig. 1: Identifying Front Door Key Cylinder Switch Connector Courtesy of Chrysler Corp. Fig. 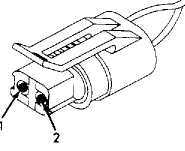 2: Identifying Liftgate Key Cylinder Switch Connector Courtesy of Chrysler Corp. Fig. 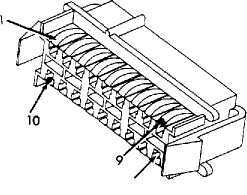 3: Identifying Mechanical Instrument Cluster Connector Courtesy of Chrysler Corp. Fig. 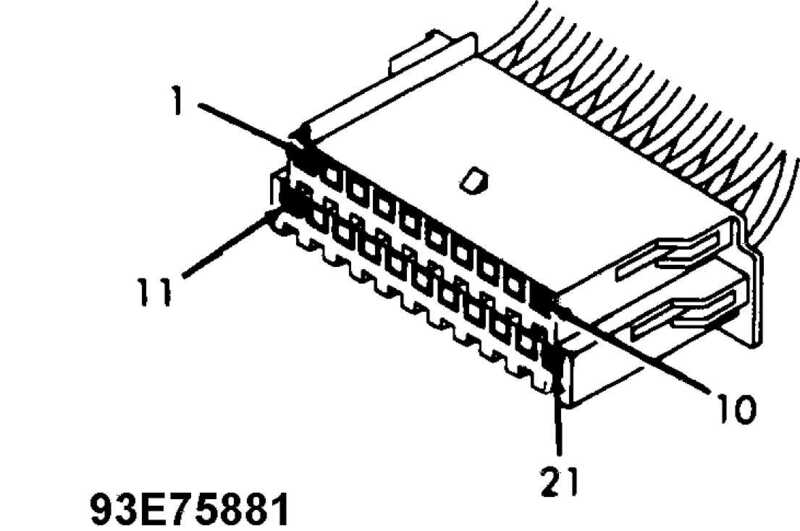 4: Identifying Powertrain Control Module Connector Courtesy of Chrysler Corp. Fig. 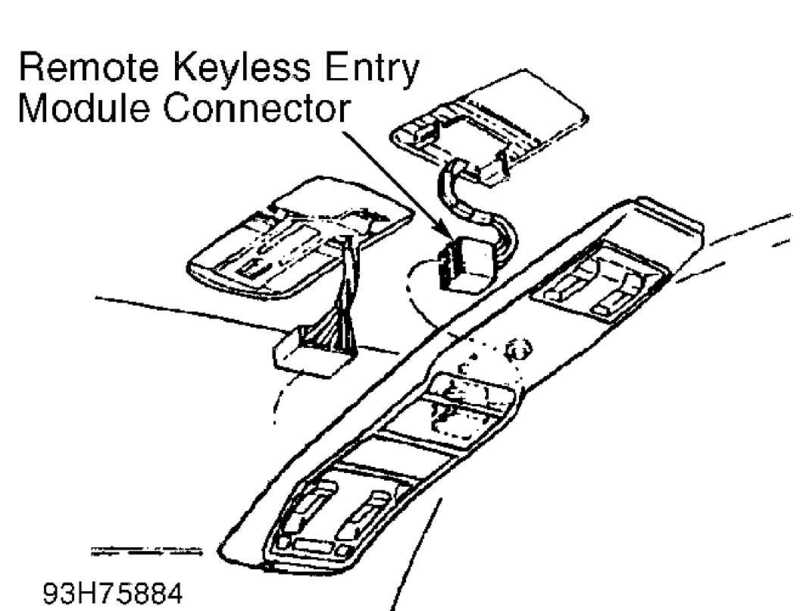 5: Identifying Remote Keyless Entry Module Connector Courtesy of Chrysler Corp. Fig. 6: Identifying Vehicle Fuse Block Courtesy of Chrysler Corp. Fig. 7: Identifying Vehicle Relay Center Courtesy of Chrysler Corp. Fig. 8: Identifying Vehicle Theft Alarm Module Connector Courtesy of Chrysler Corp.
Chrysler Corp. For connector terminal identification, see the CONNECTOR IDENTIFICATION table. For wiring diagrams, the appropriate chassis wiring diagram in WIRING DIAGRAMS article in ENGINE PERFORMANCE section. disconnecting or connecting any module connector. Once connector is disconnected, ignition can be turned on. There are no diagnostic or trouble codes for Vehicle Theft Alarm system. Only symptom diagnosis and repair are provided by the manufacturer. NOTE: Although other scan testers are available, manufacturer recommends using DRB-II (Diagnostic Readout Box II) to diagnose system. WARNING: DO NOT probe connector with an ohmmeter unless specifically instructed in testing procedure. There is a possibility of air bag deployment. 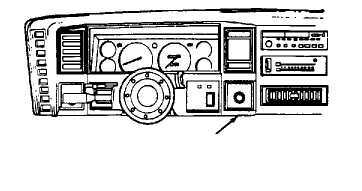 Ensure DRB-II is connected to CCD data link connector located in behind dash on right side of steering column. See Fig. 9. Ensure correct cartridge is installed in DRB-II for vehicle and system being diagnosed. Menu selections will vary depending on vehicle and system being diagnosed. Follow DRB-II screen prompts to actuate, adjust, monitor, reset, test and diagnose system as necessary. DRB-II is grounded through CCD data link connector, only one volt-ohmmeter test lead is required when using volt-ohmmeter option. DRB-II volt-ohmmeter should only be used when self-diagnostic tests require the use of this option. If DRB-II has a blank screen or displays RAM TEST FAILURE, CARTRIDGE ERROR, KEY PAD TEST FAILURE, LOW BATTERY or HIGH BATTERY, this indicates a DRB-II failure. To diagnose and correct these conditions, see BODY CONTROL COMPUTER - VEHICLE COMMUNICATIONS article in ENGINE PERFORMANCE. Fig. 9: Identifying Location Of CCD Data Link Connector Courtesy of Chrysler Corp.
- VEHICLE COMMUNICATIONS article in the ENGINE PERFORMANCE section. turn ignition switch to ACC. position. If DRB-II displays NO RESPONSE after turning key to ACC. horn does not sound, go to TEST 9A. push power door lock switch to LOCK position. sound, go to TEST 16A. RESPONSE ?. If message is displayed, go to TEST 17A. displayed, replace Powertrain Control Module (PCM). position and turn ignition on. Using DRB-II, read VTA status. If DRB-II displays CURRENT MODE DISARMED, system is functioning properly. Perform TEST VER-1. If screen does not display CURRENT MODE DISARMED, replace VTA module. Perform TEST VER-1. 1) Ensure ignition switch is off. Disconnect VTA module. See Fig. 11. Using DRB-II in ohmmeter mode, test system ground circuit for resistance at VTA module connector. VER-1. If resistance is less than 0-15 ohms, turn ignition on. Using external ohmmeter, check resistance between pin No. than 5 ohms, repair open circuit. Perform TEST VER-1. If resistance is less than 5 ohms, check resistance between pin No. 3 (White/Black wire) of CCD data link connector and terminal No. 10 (White/Black wire) of VTA module connector. If resistance is more than 5 ohms, repair open circuit. Perform TEST VER-1. If resistance is less than 5 ohms, replace VTA module. Perform TEST VER-1. wiring diagram, see appropriate chassis wiring diagram in the WIRING DIAGRAMS section. replace No. 4 fuse. Perform TEST VER-1. 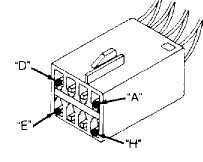 (Violet/Brown wire) of wiper circuit breaker receptacle of fuse block. Perform TEST VER-1. than 10 volts, repair open ignition voltage feed circuit (Violet/Brown wire). Perform TEST VER-1. ignition voltage feed circuit (Dark Blue wire) for short to ground. 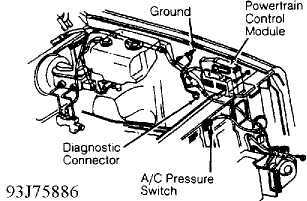 Replace wiper circuit breaker. Perform TEST VER-1. 1) Disconnect VTA module. See Fig. 11 in TEST 2A. Using DRB-II, check voltage at arm sense terminal No. 6 (Pink/Orange wire) of VTA module connector. If voltage is less than one volt, replace VTA module. Perform TEST VER-1. If voltage is more than one volt, disconnect remote keyless entry module. See Fig. 12. 2) Using DRB-II, check voltage at arm sense circuit terminal No. 6 (Pink/Orange wire). If voltage is more than one volt, repair shorted arm sense (Pink/Orange wire). Perform TEST VER-1. If voltage is less than one volt, replace remote keyless entry module. Perform TEST VER-1. volts, replace VTA module. Perform TEST VER-1. (Violet/Brown wire) of wiper circuit breaker of fuse block. Perform TEST VER-1. ignition on. Using DRB-II, check voltage at terminal No. 12 (Dark Blue wire) of VTA module connector. If voltage is more than 10 volts, replace VTA module. Perform TEST VER-1. If voltage is less than 10 volts, remove wiper circuit breaker. terminal No. 12 (Dark Blue wire) of VTA module connector. If resistance is less than 5 ohms, repair shorted circuit. than 5 ohms, repair open voltage feed circuit. Perform TEST VER-1. (Black/Red wire) of VTA module connector. If voltage is less than 10 volts, repair open horn relay control circuit (Black/Red wire). battery feed terminal No. 5 (Gray/Pink wire) of horn relay receptacle. circuit (Gray/Pink wire). Perform TEST VER-1. No. 5 (Black/Red wire) of VTA module connector with external ohmmeter. If resistance is more than 5 ohms, repair open horn control circuit (Black/Red wire). Perform TEST VER-1. 7) If resistance is less than 5 ohms, connect a jumper wire between terminals No. 1 (Pink/Light Green wire) and No. 4 (Dark Green/Red wire) of horn relay receptacle. If horn sounds, replace horn relay. Perform TEST VER-1. If horn does not sound, repair open horn feed circuit (Dark Green/Red wire). Perform TEST VER-1. more than 5 ohms, replace fuse. Perform TEST VER-1. constantly on, go to TEST 7B. If security light is not on constantly, disconnect VTA module. Connect jumper wire between security light control circuit terminal No. 17 (Black/Orange wire) of VTA module connector and vehicle ground. board. Replace circuit board if damaged. Perform TEST VER-1. terminal No. 10 (Pink wire) of MIC Natural color connector. (Black/Orange wire). Perform TEST VER-1. indicator light illuminates, repair security indicator light control (Black/Orange wire) for short to ground. Perform TEST VER-1. If security indicator light does not illuminate, replace VTA module. Perform TEST VER-1. illuminate, disconnect VTA module. See Fig. 11 in TEST 2A. park/taillight control (Dark Blue/Red wire). 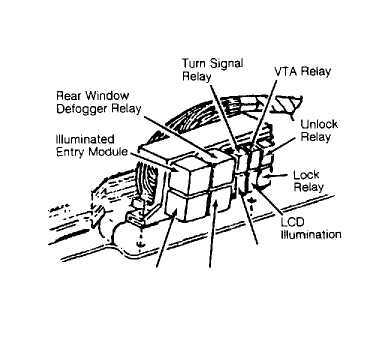 headlights illuminate, disconnect VTA relay. See Fig. 10 in TEST 1A. DO NOT turn off high beam headlights. (Red/Orange wire) of VTA relay receptacle using DRB-II. If voltage is less than 10 volts, repair open VTA relay output circuit (Red/Orange wire). Perform TEST VER-1. If voltage is more than 10 volts, check fused battery feed voltage at terminal No. 1 (Pink/Light Green wire) of VTA relay receptacle using DRB-II. voltage is more than 10 volts, check resistance of relay ground (Black wire) at terminal No. 3 of VTA relay receptacle using DRB-II. If resistance is more than 20 ohms, repair open VTA relay ground. Perform TEST VER-1. 4) If resistance is less than 20 ohms, disconnect VTA module. (Pink/Light Green wire). Perform TEST VER-1. wire) of VTA module connector using external ohmmeter. VTA relay. Perform TEST VER-1. than 5 ohms, repair fused battery feed wire for short to ground. voltage is more than 10 volts, repair open fused battery feed wire. ohms, replace fuse. Perform TEST VER-1. lights that are not functioning. not display closed (CLSD), go to TEST 9B. If DRB-II displays closed (CLSD) status, disconnect left front door jamb switch. If status screen does not display closed (CLSD), replace door jamb switch. Perform TEST VER-1. displays closed (CLSD) status, disconnect right front door jamb switch. If status screen does not display closed (CLSD), replace door jamb switch. Perform TEST VER-1. displays closed (CLSD) status, disconnect liftgate latch sense switch. See Fig. 13. If status screen does not display closed (CLSD), replace liftgate latch sense switch. Perform TEST VER-1. voltage is less than 10 volts, repair open door jamb sense wire. done. Perform TEST VER-1. If repairs were done, perform TEST VER-1. Disconnect VTA module. See Fig. 11 in TEST 2A. Using DRB-II, check door jamb sense circuit voltage at terminal No. 3 (Yellow wire) of VTA module connector. If voltage is less than 10 volts, repair open door jamb sense wire. Perform TEST VER-1. If voltage is more than 10 volts, replace VTA module. Perform TEST VER-1. See Fig. 11 in TEST 2A. circuit at terminal No. 20 (Brown/Tan wire) of VTA module connector. than 5 ohms, replace VTA module. Perform TEST VER-1. display closed, replace VTA module. Perform TEST VER-1. and aligned. VTA system should still be diagnostic mode. ON position to fully arm VTA system. Return back to TEST 1A. connect jumper wire between liftgate latch switch connectors. Determine that power doors locks are functioning properly. Repair door locks that are not functioning properly. lock switch to LOCK position. If voltage is more than 10 volts, replace VTA module. switch sense circuit (Orange/Violet wire). Perform TEST VER-1. lock switch to UNLOCK position. unlock switch sense circuit (Pink/Violet wire). Perform TEST VER-1. left front door switch connector. Connect jumper wire across both terminals of connector. key cylinder switch. Perform TEST VER-1. DRB-II, read DOOR KEY CYLINDER SWITCH (DR KEY CYL:) status. vehicle ground. DO NOT disconnect VTA module connector. screen does not display CIRCUIT CLOSED (CLSD), replace VTA module. right front door switch connector. Disconnect left front door key cylinder switch connector. CLOSED (CLSD), disconnect liftgate key cylinder switch. module. See Fig. 12 in TEST 3A. Green/Orange wire) for short to ground. Perform TEST VER-1. Green/Orange wire) of VTA module connector. If resistance is less than 5 ohms, repair disarm sense (Dark Green/Orange wire) for short to ground. Perform TEST VER-1. If resistance is more than 5 ohms, replace VTA module. Perform TEST VER-1. liftgate key cylinder switch connector. liftgate key cylinder switch. Perform TEST VER-1. wire) of liftgate key cylinder switch connector and vehicle ground. Using DRB-II, read DOOR KEY CYLINDER SWITCH (DR KEY CYL:) status. Turn ignition to OFF. Disconnect the PCM module connector. ohms, replace PCM module. See Fig. 14. Perform TEST VER-1. If malfunction is with disarm system, go to TEST 18B. Disconnect Remote Keyless Entry (RKE) module. See Fig. 12 in TEST 3A. fused battery feed circuit (Pink wire). Perform TEST VER-1. ohms, check resistance of arm sense circuit at terminal "F"
(Pink/Orange wire) of RKE module connector using DRB-II. circuit (Pink/Orange wire) for short to ground. Perform TEST VER-1. If resistance is more than 5 ohms, connect jumper wire between fused battery feed terminal "A" (Pink wire) and arm sense terminal "F"
(Pink/Orange wire) of RKE module connector. If security light flashes, replace RKE module. Perform TEST VER-1. 4) If security light does not flash, disconnect VTA module. Using external ohmmeter, check resistance of arm sense circuit. VTA module. Perform TEST VER-1. than 10 volts, replace RKE module. Perform TEST VER-1. Information is not provided from manufacturer. See appropriate wiring diagram in the WIRING DIAGRAMS article in the ENGINE PERFORMANCE section.